I found this oddball piece of news in an Asian daily newspaper. A Dutch entrepreneur named Remco van Daal set up a North Korea-style restaurant in Amsterdam, the Netherlands, called Pyongyang Restaurant. This restaurant is an “independent” venture and should not be confused with the Pyongyang restaurant chain that exists in parts of Asia that are owned and operated by the Democratic People’s Republic of Korea (DPRK, or North Korea) government. For those not familiar with the DPRK’s capital, it is Pyongyang. All of the money spent at the restaurants owned by the DPRK go directly to the DPRK. But not the one in Amsterdam. However, the staff at the Amsterdam restaurant come from a nearby hotel owned by North Korea (and yes, all of the staff at the hotel are North Korean). Van Daal set up the restaurant of course to serve North Korean dishes. When one enters the restaurant, according to the article, there are portraits of the North Korean rulers Kim Il-sung, Kim Jong-il, and Kim Jong-un. There are also propaganda portraits of happy workers and farmers, beautiful North Korean scenery, and of course beautiful tableware fit for a five star restaurant. This sounds all nice and good. Guests are treated to fine sumptuous dinners such as the North Korean version of kimchi, all kinds of meats and seafood, and of course North Korean entertainment. The man who created all of this, Remco van Daal, believes that the DPRK is a “little known” country and that to this end he had previously established the DPRK Foundation in the Netherlands to help send Dutch nationals go on tours to the DPRK to try and better know that country. Well, I have no problem with an enterprising person who wants to promote the DPRK. I have no problem for also trying to promote North Korean culture. Here is an important fact: the North Korean government does not allow anyone traveling on a U.S. passport to enter the DPRK. This is true for all American nationals except those Americans who receive a “special” invitation from the North Korean government to go there. There are few countries as hostile to the very existence to the United States as the DPRK. 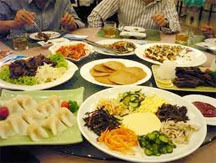 I would also wager that a lot of the fine foods offered in the Pyongyang Restaurant are never seen by the North Korean people in their own country. So many North Koreans are going hungry now that many are fleeing to China. I just find it hard to accept a restaurant or anything that promotes a “happy” side to a regime that is guilty of starving a couple of million of its own people to death, that keeps hundreds of thousands of political and religious prisoners in vast slave labor camps, of political repression so severe that people have no right to move, marry or change jobs without permission, and with a regime that allows absolutely no personal freedoms whatsoever. For me, I could never have a clear conscience knowing all this and enjoy myself at such a place at the same time. I hope that any and all who go there have a wonderful time!